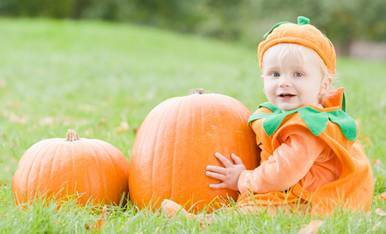 Dressing up your infant or toddler for Halloween can be fun for you both, while also providing an ideal photo opportunity for memorable family pictures. These early years pass quickly, so dress your child in an endearing costume that will, in the future, give you both a smile as you remember sharing this particular Halloween. Create the pumpkin base using a sweater or sweatshirt that is slightly too big for your child. Cut a jack o’lantern mouth and eyes from black felt and glue them to the front of the shirt. If desired, cut large leaf shapes from green felt and glue them around the shirt collar. Dress your child, then lightly stuff the front and back of the shirt with lightweight quilt batting or wadded sheets of newspaper. Complete the pumpkin with a green or orange close-fitting cap. Cut green leaves from felt and glue them to the top of the cap. Make a sunflower costume for your toddler by cutting flower petals from yellow felt and gluing them around a brown, close-fitting cap. Dress your child in a green one-piece outfit, or matching green top and pants. Large felt leaf shapes can be glued to the shirt collar. Buy a child’s watering can for carrying candy. Embellish the front of a pair of green “footie” pajamas with three large felt peas set in a felt pod. Cut felt leaves and a stem, then glue these to a green hat. You could also fashion a tendril or two out of a green chenille stem and glue this between the leaves. Dress your little girl in pale pink tights and a close-fitting top. Thread elastic through a long length of pink tulle, gather into ruffles to make a ballerina skirt, then tie together to fit comfortably around the waist. Add ballerina-style slippers to complete the dancer’s ensemble. from Amazon. This is obviously not an outfit to be worn outdoors, but you have to admit it makes for an adorable photograph.